Cardiovascular disease is the #1 cause of death in the developed world, and for more than 50 years, standard medical advice has been that the best thing we can do to lower our risk of CVD is to reduce saturated fats in our diet. The theory is that saturated fats lead to higher concentrations of cholesterol in the blood, and cholesterol in the blood leads in turn to formation of blockages that cause heart attacks. There is strong, science-based opposition to this thesis, however. Both parts of the inference have been attacked: that saturated fat intake does not increase serum cholesterol, and that serum cholesterol does not cause heart attacks. When my daughter was still in kindergarten, her pediatrician told us that her blood cholesterol was high, that she probably had a congenital predisposition to high cholesterol, and that we should begin early to modify her diet to moderate her risk of hert disease later in life. Now my daughter is 28 and she asked me last week if she should be eating less chocolate and coconut to protect her long-term health. I knew enough to know that the answer to her question was a subject of deep controversy, and I didn’t know where I stood on the subject. In my daughter’s honor, I am devoting this week and next to researching cholesterol and will report the results here. Here are some questions I set out to answer. (Please post comments suggesting your own). If your cholesterol is high because of diet, does this lead to increased risk of heart disease? If your cholesterol is high because of your genes, not diet, does this lead to an increased risk of heart disease? Does consumption of saturated fats lead to higher levels of blood cholesterol? What foods contribute to high/low cholesterol levels? Are there supplements that help to lower cholesterol? If so, what is their effect on overall mortality risk? How does treatment with statins compare to treatment with diet and supplements? It has been standard practice among doctors for the last 50 years at least to treat serum cholesterol levels as a risk factor for heart disease, and to assume that there is a causal connection. Half of Americans over 65 are taking prescription statin drugs (and ⅙ of people between 45 and 65) [ref]. It’s clear that statins lower cholesterol in the blood, but whether the drugs lower risk of heart disease is less clear, and there may be no benefit at all for overall mortality rate [ref]. The above questions are difficult because there is such a deep division of opinion in the medical community. The mainstream view, which has the best data and the best studies behind it, is also suspect, in my mind, because so much of the science has been funded by the pharmaceutical industry. Statin drugs are a $35 billion dollar industry in America, growing rapidly, and I have seen an estimate as high as $200 billion per year worldwide. Here is a semi-popular report published by Harvard Medical School health blog. Peter Wehrwein notes that statin use is rising rapidly and heart disease deaths are falling rapidly. A nutrition conference in Copenhagen (2010) produced the take-home message that every time an individual replaces 1% of the saturated fats in his diet with poly-unsaturated fats, his blood cholesterol decreases enough to afford a 2 to 3% reduction in risk of heart attack. Opposition to the standard hypothesis (saturated fats => High LDL => Stroke and heart attack) is not limited to the “natural medicine” community. It is broad and varied, some of it well-rooted in standard methodology of biochemistry and epidemiology. I know of no other place in standard medical practice where the gulf between credible, opposing viewpoints is so vast. I will continue to read, and next week promise to report what I can about why the disagreements are so deep and the contradictions so stark. Petroleum oils are simply chains of carbon atoms surrounded by hydrogen. Each C can make 4 bonds, so most of the C’s in the middle attach to one C on each side and two more H’s. Organic oils and fats are “fatty acids”, which means that they differ from the simple chains by the addition of an “acid group” on the end. An acid group has two extra oxygen atoms, and is written COOH. These are all saturated fats, meaning “as much hydrogen as the carbons can hold”. This makes more sense when we define an unsaturated fat as one that has double-bonded carbon atoms. Some C’s instead of being attached to 2 C’s and 2 H’s have only 1 H. They still have 4 bonds total, so they devote an extra bond to each other – a “double bond” between C’s. Double bonds are more chemically reactive. It is easier to break the chain at a double bond than at another place along the chain where there are only single bonds, and so fats with double bonds are more easily oxidized during cooking than saturated fats. Unsaturated fats have a lower melting point, and are likely to be liquid at room temperature. Trans fat: Here’s a curious and useful fact from chemistry: the atoms in a molecule are always vibrating, wiggling and bouncing around. Part of this is rotation around each bond. Single bonds can rotate freely. But double bonds cannot rotate. This means that the double bonds create the possibility of two different forms of a molecule. The part of the chain on the right and the rest of the chain on the left of the double bond can be on the same side, creating a bent, V-shaped chain. This is the “cis” form. Or the two parts of the chain can be on opposite sides, so the double bond appears as just a kink in the chain, but not a bend. This is the “trans” form. This is a double bond in the “trans” configuration. There is no bend in the chain. Trans fats have a little kink in the chain, but the chain is basically straight. “Cis” fats are V-shaped molecules with a bend in the middle. Cholesterol is an essential, multi-purpose chemical, manufactured and used by every animal species and every cell within the animal. Cholesterol gives cell membranes their pliability, and it is also used as a raw material for synthesis of hormones within a cell. 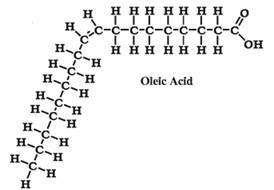 The molecular structure is much more complicated than the fatty acids described above. It contains four linked rings of carbon atoms, and one OH group in the lower left corner, making it technically an alcohol. Since cholesterol has very limited solubility in water, it is carried around in the blood by lipoproteinmolecules that attach onto the cholesterol molecule at one end and dissolve in water at the other end. High density lipoproteins (HDL) are called “good cholesterol”, and low density lipoproteins (LDL) are called “bad cholesterol”, but whether this blood constituent is actually related to risk of heart disease remains in dispute. Keep digging… the whole cholesterol thing has seen way too much unscientific attention. Everyone is banking on something. The media creates fear, the industry wants to sell more pills but the truth is buried somewhere under all that. 1) If your cholesterol is high because of diet, does this lead to increased risk of heart disease? I don’t think you can reduce this complicated topic to such a simple question. Recent years saw the rise of different cholesterol markers in the blood (LDL, HDL…) and while some seem to be protective against CHD others seem to increase the risk. The real question should rather be: Are these low/high markers symptoms of the underlying disease or are they really causing it? 2) Does consumption of saturated fats lead to higher levels of blood cholesterol? The straight answer is yes. But saturated fats have been shown to increase both good and negative markers of cholesterol so you end up with a “zero” effect or even improve your health with enough saturated fat intake. This is quite contrary to other types of fats especially processed/trans fat which greatly increase LDL but not HDL. This is a big topic, and I’m in way over my head trying to summarize it in two weeks. But I’m giving myself a crash course on the subject because I realize how the questions are both central and controversial. I’ll let you know what I find. Thanks for the leads, Stefan. Thanks for tackling this controversy. I’m not a proponent of the use of statins–preferring diet & supplements to better my counts to borderline levels–but has Dr. Kummerow considered that if cholesterol is lowered then there is less cholesterol around to get oxidized? Also, I’d like to see what the anti-statin crowd think of that compelling chart showing a down trend in CVD with the introduction of statins. Odd, though, that the curve is so linear (ie, the rate of decrease appears to be steady even though the curve of actual statin use probably was not. Shouldn’t it be shallow in the beginning and steepest at the height of statin use?) I’d put my money on the ever increasing use of anti-oxidants as a cause of lowered CVD mortality. Interestingly and as an aside, the curve of cancer deaths is not showing the predicted negative effect of anti-oxidant use, as recently theorized by Watson. I’m looking forward to your coming posts. “Tackling” is hardly what I’ve done. I’ve barely begun to get a feel for the deep divides that plague this research. Caloric restriction works much better in worms than people. There are many substances that extend lifespan in worms, fewer in flies, and fewer yet in mammals. The CR pathway is already well-addressed by metformin. We will soon saturate this life extension pathway and gain perhaps 5 years of lifespan (maybe 10 or 12 years of healthspan). So unsaturated fats are good for you and saturated fats are bad. Yet we find one of the two main differences between long-lived animals and short-lived animals is that the long-lived animals have more saturated fats in their membranes. The double bonds of the unsaturated fats make a good target for free radicals produced by the mitochondria. I think someone needs to go back and redo these unsaturated fat studies. In the mean time I am shying away from unsaturated fats, and looking to olive oil for my salad oil, plus a little fish oil for the necessary unsaturated fats. Google: Why animals don’t get heart attacks; but humans do? Animals make their own vitamin C; but humans do not.